And now, just for fun, I present the inaugural Robbie Awards! I'm a critic, kind of. 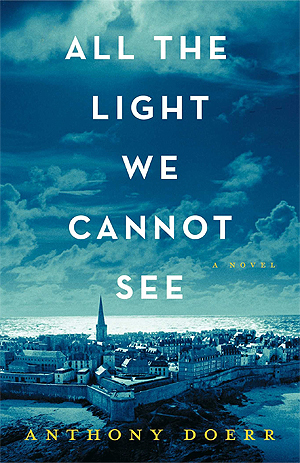 And in my critical opinion, the best book on the above list, in terms of literary merit, is All the Light We Cannot See by Anthony Doerr. I'm people, too. 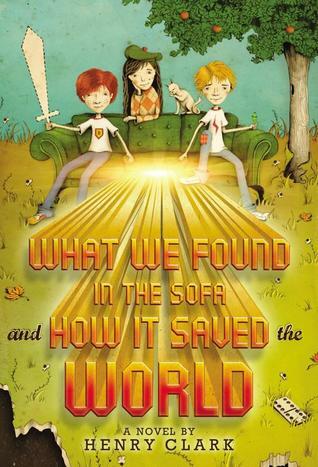 And my favorite book on the above list, by dint of pure fun and popular appeal, is What We Found in the Sofa and How It Saved the World by Henry Clark. Some of my book reviews this year were based on pre-publication proofs. Of the ones I read shortly before they were released, I think the best was The Evil Wizard Smallbone by Delia Sherman. I don't limit my reading to new releases, however. In a tough decision, I reckon the "oldie" I most enjoyed rediscovering was Farewell, My Lovely by Raymond Chandler. Again, this is a tough category, but I think I have to give it to Wil Wheaton's performance of Armada by Ernest Cline. This was not a very big year for me in terms of non-fiction reading. But out of the small group of competitors, the one that really stood out was The Rest Is Noise by Alex Ross. 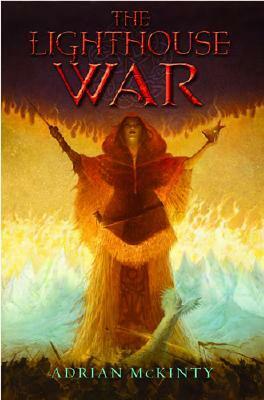 This wasn't a very competitive category, but out of approximately three candidates, I'm going with The War of the Dwarves by Markus Heitz. Again, the choices in this category are extremely limited. I read maybe two books all year that don't quite measure up to novel length. I guess the winner is The Liszts by Kyo Maclear. I'm not going to do this. But believe me, if I was going to honor the worst book I read this year, in the spirit of the Golden Raspberry Awards, I would have no trouble naming the winner. For Kindle: The Little Sister by Raymond Chandler, a book I've had a hard time finding in stores and libraries. Queen of Sorcery by David Eddings - Book 2 of "The Belgariad." I shopped for it at two different bookstores during my last visit to St. Louis. In one store, I could have gotten it as part of an omnibus volume; but I hate omnibus volumes. The other store had every book in the series except Book 2. The Great Hunt by Robert Jordan, Book 2 of "The Wheel of Time." A Darkness at Sethanon by Raymond E. Feist, Book 4 of "The Riftwar Saga." The Book That Proves Time Travel Happens by Henry Clark, author of the People's Choice Award winner above. I thank you for reading with me. Won't you read with me again next year? Prince Arutha of the great city of Krondor, in the Kingdom of the Isles, in the fantasy world of Midkemia, has scarcely returned from accompanying his brother, lately crowned King Lyam, on a year-long diplomatic tour, when there is an attempt on his life. The assassination attempts grow increasingly fierce and difficult to stave off, which is especially troubling now that Lyam is on his way to Krondor, bringing with him Arutha's intended bride, Princess Anita. Even the combined energies of a boyish thief named Jimmy, a seasoned man-at-arms named Martin, and a roguish minstrel-fighter named Laurie cannot prevent tragedy from striking on the couple's wedding day. It seems there is a dark power behind this campaign against Arutha's life. It has something to do with a moredhel, or dark elf, calling himself Murmandamus, and claiming the support of an ancient prophecy to muster an army of evil against the world of men. But if Murmandamus is the promised Darkness, that would make Arutha the Bane of Darkness, who alone can stop him. You can see how that might make things a bit uneasy. Throw in some disturbing magic, which brings slain slayers back as all-but-invincible undead warriors, and some dark magic that can send practically weapon-proof monsters over long distances to attack a target whose movements the enemy can somehow track, and you won't be betting heavily on Arutha's survival. Nevertheless, he is more worried about finding an almost mythical plant called silverthorn, which is said to be the only cure for the poisoned wound that is killing Arutha's bride. To find it, he and a small group of tough but resourceful friends will have to march straight into the heart of moredhel territory, to a Black Lake sacred to the forces of evil that, by the way, are all camped around it, waiting for Arutha to fall into the trap. That's all. Meantime, someone has to deal with the larger problem of the great force of evil gathering against all of Midkemia - some nameless power of which Murmandamus is only a servant. Since the prince is rather preoccupied by his mission to save Anita, even if it kills him, the task of identifying their foe and preparing to fight it falls to good old Pug, the kitchen boy who grew up to be the greatest magician in not one but two worlds. Leaving his wife, their son, and the snug little island where he is building a school of magic, Pug returns to the alien world of Kelewan, where he spent time as a prisoner of war and a slave before becoming an adept of the Greater Path. After a year away, he finds his homeworld-away-from-homeworld a bit less welcoming than when he last saw it. Actually, there's an interdict against him, revoking his privileges as one of the Great Ones, who are above the law of the Tsurani Empire, and instructing anyone who sees him to turn him in or face really ugly consequences. Pug just wants to visit the library of the magicians' Assembly to look up a few things. But before he can do that, he'll have to turn Tsurani society upside-down... again. Rest assured, you won't rest assured - in fact, you might lose a night or two's sleep over the shuddering horrors, the fierce battles, the suspense, the intrigue, the exotic scenery, and the awe-inspiring discoveries Arutha and Pug make during their separate but intertwined quests. One of the strange things about this book, unless you've grown used to it from reading these characters' previous adventure, is how it ignites the senses with a richly enveloping fantasy world (two worlds, actually, plus an endearingly science-fictionish bridge between them), yet it never loses the reader in thickets of scenic description or points on an imaginary map. Another strange thing is how this book places so many moving pieces on the board, allowing each an opportunity to come alive as a distinctive personality, yet never leaves one confused by the glut of speaking characters. There's so much in here, it should be hard to hold in one's mind - but it isn't. The farther its heroes stray in an increasingly vast and diverse world of oddities and surprises, the harder it should be to sense where, when, or if the story is going to end. But it isn't. Rather, the dramatic arc bends, if possible, more swiftly toward closure, even while the prospect of another great adventure breaks open. I'm still a noob in the Riftwar series, so I have to admit, I'm already confused about how far into it I am - and this is only the second book. Or maybe the third. Exactly what constitutes a "book" in Raymond Feist's 30-odd-year, 30-odd-book fantasy universe seems to be a somewhat open question. By some accounts, Magician is one book, and therefore, this is the second book of the series; this seems to align with the author's intentions. But some U.S. editions split Magician into two books, Magician: Apprentice and Magician: Master. Adding to the confusion is the fact that the internal divisions within Magician are designated as "Book I: Pug and Tomas" and "Book II: Milamber and the Valheru." 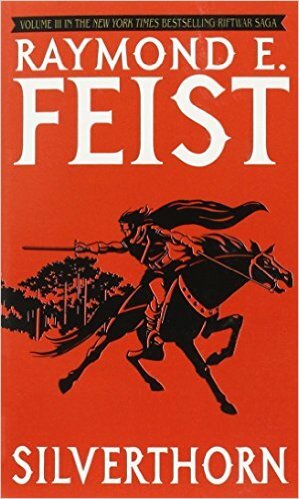 Muddying the waters further, this book, apparently intended by Feist as the second volume in the saga, begins with a condensed synopsis of Magician followed by a title page saying, "Book III: Arutha and Jimmy." So which is it? Book 2 or Book 3? Silverthorn or "Arutha and Jimmy"? Aaargh! Things go much smoother once the story gets underway. There is definitely a sense that Magician (apprentice and master) is a complete unit in the history of the worlds of Midkemia and Kelewan - the conflict between them, mainly, with a broad hint at the end about a larger conflict that may soon rise up against both of them. It has a satisfyingly rounded story shape unto itself. Then the story of Silverthorn takes shape, not merely as the next page in one vast history, but as a second distinct adventure between the same two worlds. And even though it ends in a way that dovetails directly into the third (or fourth) volume, A Darkness at Sethanon, the dramatic shape of this book closes firmly and convincingly at the end. It makes me all the more eager to read what comes next. Willa Fuller, on the cusp of age 13, doesn't have much in common with other kids her age. Instead, she spends most of her free time at Eldritch Manor, a retirement home for magical creatures, including her wheelchair-bound mermaid grandmother Belle. This also distances Willa from her parents a bit, since her mother has never forgiven Belle for abandoning her and Grandpa when she was a girl. Tensions have started to ease since the old-folks' home has started to be rebuilt (by dwarf labor, of course) following a fire resulting from a deadly conflict with the dark side - don't ask, it's a long story - and now that Belle has moved out of the Fuller home and back into the manor. But as Willa explores strange powers she has only recently begun to discover in herself, she learns something that threatens to drive a rift between her and her mother. Meantime, things at Eldritch Manor are unusual, as usual. Mab, queen of the backyard fairies, receives an unwanted romantic visit from her alienated husband Oberon, bringing stormy weather upon the neighborhood. 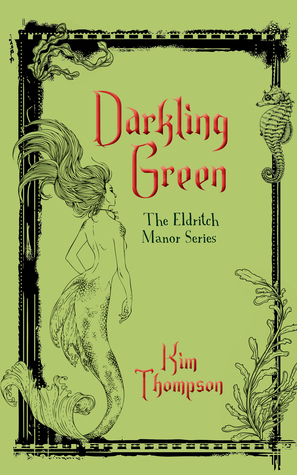 The disruption in Mab's knitting of the time-scarf that keeps the manor anchored in reality leads, first, to the discovery of two portals in time at the bottom of the home's algae-covered swimming pool, which Willa can only explore after she overcomes her terror of water and embraces her mermaid side. The time problem also leads to the arrival of a big, hairy, black spider with super knitting skills - though her fancy stitchery has its own weird effect on the passage of time. And then there is the vine growing out of one of those underwater time holes; its foliage rapidly spreads, taking over the forest behind the manor, and gradually forming a humanoid figure similar to one that keeps showing up in Willa's scariest dreams. At first, these problems seem to be only part of the usual unusualness of a place inhabited by a forgetful sphinx, a centaur, a phoenix, a cat in human form, a shape-shifting dragon who gets grouchy when her hibernation is disturbed, nine dwarves with unpronounceable names, several heavily armed bunnies, loads of capricious fairies, and a martial-arts maven who has adopted a baby basilisk as his pet. It's a place where rooms change size based on what's going on inside them, where the attic stays up in the air even before the second and third floor are built under it, and where the pool is sometimes just a pool, but sometime seems to be part of a much bigger ocean. As the whimsical, everyday problems of such a magic-soaked place gradually build to a climax of danger, and an evil plot threatens everyone, Willa must discover her place in an enchanted world that only she can save. This is a funny, heartwarming book touched with breathtaking glimpses of magical beauty and beautiful magic. Well-crafted to appeal to middle-school-aged readers, it conceals a firm grounding in mature realism and a concern for the coming of age of a strong, independent young woman. There are touches of neo-paganism in it, such as the depiction of a neighboring family celebrating Beltane - so I declare an Occult Content Advisory. But Willa's willing acceptance of mythological creatures in the ordinary, present-day world also suggests Eldritch Manor exists in a fantasy dimension that should not necessarily be read at face value. And if, in its early chapters, the book seems to over-indulge in establishing a cozily quirky setting, it makes up for that impression later as the danger of an all-devouring evil escalates to a scary, exciting conflict. This is the third novel in the "Eldritch Manor" series, coming after Eldritch Manor and Shadow Wrack. It seems to leave a door open to the possibility of further adventures. Kim Thompson is a Canadian author, television writer, and filmmaker. This review is based on a pre-publication Kindle proof made available through Netgalley dot com. The paperback becomes available Dec. 27, 2016. The idea for this little Christmas ditty came to me during Christmas Eve worship, and I finally wrote it down yesterday, Christmas Day. 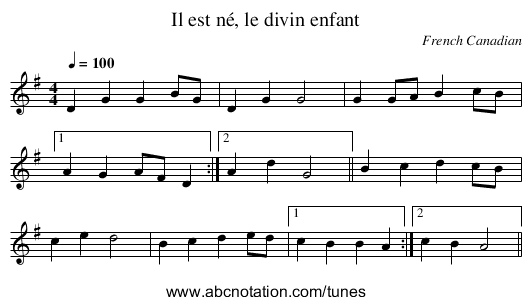 It was designed to go with the tune of the French-Canadian noel IL EST NÉ, known to some in English as "He is born, the Child divine." 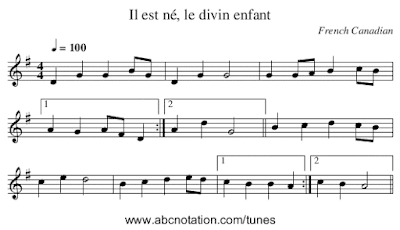 Note, the piece begins with a musical refrain, which is then repeated after each stanza - although the refrain lyrics in my version vary from one stanza to another. Unfortunately, the tune notated below lacks the "da capo" and "fine" markings to show this. All our songs to Him are keyed. When He rose, He slew the grave. All our hopes in Him succeed. Through His triumph, all is well. All good gifts from Him proceed. Rule in us, let faith increase! All our hearts with Him agreed! 'Til we see Your throne restored! 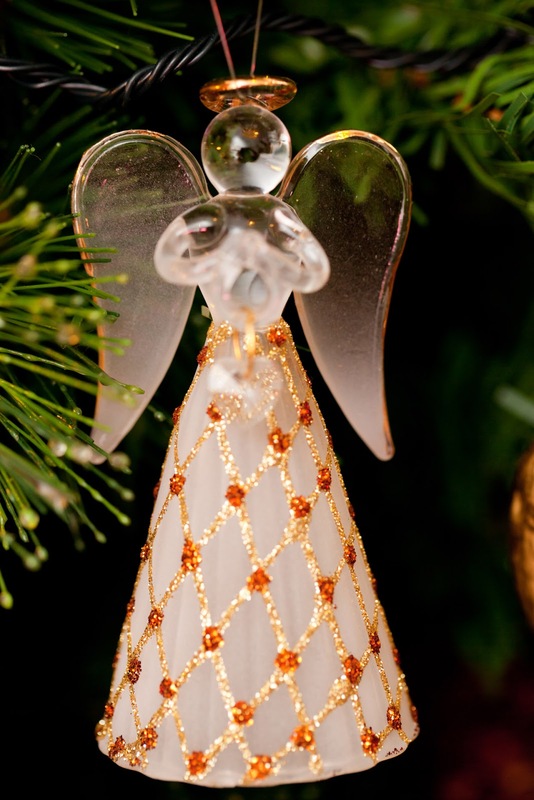 Christ is born, the Virgin's Seed! Draw us all to You with speed! In this book, frequently decorated by eerie vintage photos, modern-day kid Jacob is on the run with a group of "peculiar" children who have been living in a one-day time loop in 1940 since, like, 1940. The ymbryne, a woman named Miss Peregrine who sometimes shape-shifts into the bird for which she is named, is stuck in her bird form and injured to boot. The children are trapped in World War II-era Britain, dodging bombs, narrowly escaping capture, and pursued by hungry, unimaginably hideous monsters called hollowgast (fact: they have multiple tongues, which they use to walk and grab things). Time is running out before Miss Peregrine forgets her humanity altogether. Without her to create a time loop around them, the peculiar children will begin to rapidly age, eventually dying and crumbling into dust. Also, Jacob will be trapped, alone, in his grandfather's time, never able to return to his worried parents. To stop all this from happening, they have to get to London and find another ymbryne to help Miss Peregrine... But nearly all the ymbrynes have already been captured by an enemy that wants to devour their souls and use their powers to take over the world. The hollowgast are only the juvenile versions of these beings, known as wights, which can take human form - more or less. The kids don't have much but each other to fight back against this evil, which has grown so strong that its triumph seems inevitable. On the other hand, peculiar as they are, Miss Peregrine's children have a lot going for them. They include Bronwyn, a girl of enormous strength; Olive, who is lighter than air; Enoch, who can re-animate the dead; Hugh, who lives in communion with a hive of bees; and besides them, invisible Millard, future-telling Horace, and fire-starting Emma, with whom Jacob has fallen in love. Along the way, they encounter other peculiars, including a talking dog, a girl who can survive having a hole bored through her middle, and a pair of blind, echo-locating brothers linked by a single mind. Kids with powers like these would be unstoppable, if they didn't have to worry about falling bombs, ravening hollowgast, grabby wights, and the fatal danger of being caught too long outside a time loop. As they get closer to the object of their quest in this book, Jacob and his friends also descend into a darker, deeper layer of reality, where dangers lurk that they never knew to fear. And just when they think they have reached their goal, another terrifying chapter opens before them. 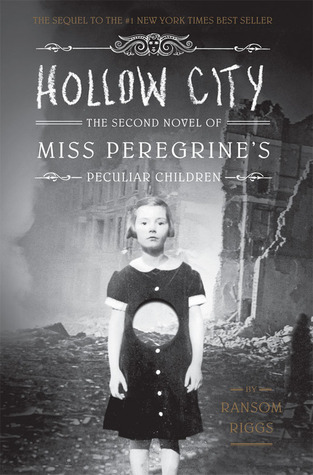 This is the second book in the "Miss Peregrine's Peculiar Children" series, of which the first book, Miss Peregrine's Home for Peculiar Children, has already been made into a movie. The third book is The Library of Souls. Ransom Riggs has also written a non-fiction book about Sherlock Holmes, and another about strange old photographs, like the ones he uses as illustrations in this series of books. I have enjoyed both of the first two books in this series, although by taking the audio-book route to the first book, I missed out on the vintage photos. They both bear witness to an author with a full command of the ingredients for cooking up bizarre imagery, dread-filled suspense, and a world of magic that would be adorable and fun if it weren't so gosh-darned full of scary creatures and sickening evil. 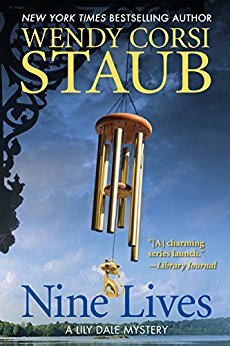 It's a dark, disturbing world of magic that nevertheless draws Jacob into it for reasons that seem to work for millions of readers, and in this second book, it grips them even tighter. Evan Quick has always fantasized about becoming a Mask - his alternate-history world's version of a superhero, fighting villanous metahumans known as Hoods - but when super-healing abilities, combined with a bit of super-strength, super-speed, and suicidally lippy super-banter suddenly manifest during a class field trip-turned-hostage crisis, Evan begins to realize not everything about being super is super. To start with, he barely survives a direct hit from Spartanicus' death ray, putting him on the wrong side of the strongest Hood alive. At the same time, his act of heroism instantly makes him a rival of top Mask Captain Commanding, whose willingness to do awful things in the service of his ego lead him to be described as a great man who isn't a good man. Also, his sudden transfer to the Academy of Metahuman Operations, a.k.a. Hero High, a.k.a. 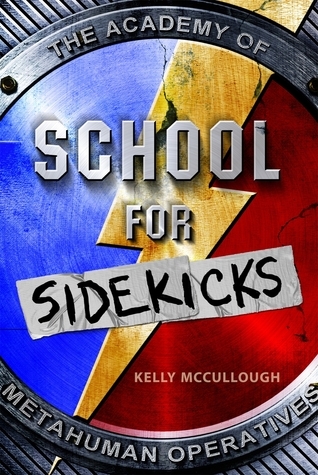 School for Sidekicks, creates a rift between Evan and his worried parents back on earth. Did I say "back on Earth"? Yes, because the AMO is on Deimos, one of the moons of Mars. That's how wide the rift is. So Evan finds himself far from home, surrounded by kids with their own weird powers and more or less massive chips on their shoulders, learning subjects like Combat with Dinnerware and Superhero Repartee, and slowly growing to suspect their school, along with O.S.I.R.I.S., the Mask/Hood-regulating agency that runs it, is built on lies and secrets. Getting to the bottom of these secrets will require Evan to risk getting into a lot of trouble, learn to work with some prickly personalities, and perhaps bear the wrath of far more powerful people whose position on the good/evil slider is tricky to assess. And then, even though he is a newbie with lame, barely-sidekick-caliber powers, apprenticed to a troubled, has-been hero who only took him on as an insult to Captain Commanding, Evan - codename Meerkat - finds himself with the weight of saving the world on his shoulders. It's a funny, action-filled adventure full of gee-whiz concepts that are sure to light up the imagination of readers junior-high-age and older. It conjures an alternate version of the Twin Cities, rebuilt in the aftermath of a catastrophe that created the world's first and strongest Masks and Hoods, and even mentions a metro-area high school that I attended when I was a little older than Evan. So maybe I had extra-personal reasons to be drawn into this fantasy world. It also experiments with some written special effects that I haven't seen before, such as a graphic that seems to represent time going backward, and a couple passages in which disconnected jokes and rejected story ideas seem to be strung together to create a montage effect. The book teems with quirky gadgets, offbeat superpowers, and unexpected problems one might discover by simply thinking through the implications of a world with superheroes and supervillains. It sparkles with wit, charm, warmth, and character that should appeal to an even wider audience than the fans of Sky High, Lab Rats, and other teen superhero franchises - not to mention Harry Potter fans, whose favorite school for magic is also mentioned in this book as a fictional counterpart to Evan's school. Other books I might as well mention, for those who want to read more of the same kind of thing, include John David Anderson's Sidekicked, Mike Lupica's Hero, Matt Myklusch's The Accidental Hero, and on a more adult level, Samit Basu's Turbulence. Kelly McCullough is a Wisconsin-based author whose work includes the five-book "WebMage" series and the six-book "Fallen Blade" series. He also wrote a companion novella for this book, The Totally Secret Origin of Foxman. To express how eager I was to read this second book in the "Repo Man" or "Ruddy McCann" series (after Midnight Plan of the Repo Man), I shouldn't need to say much more than, "I paid full price for the hardcover at Barnes & Noble." That's $25.99, folks. And I'm cheap. The last new-release hardcover I bought before this was Harry Potter and the Deathly Hallows - a few minutes past midnight, July 7, 2009. But I loved Ruddy McCann, and I pestered booksellers at several other stores before I found a copy that had just arrived and hadn't even been put out on the shelf. And then I quit reading another book I was really enjoying because I couldn't wait to read this. Now let me add: I was not disappointed. Need I say more? OK, so I'll say more. Ruddy McCann, in case you don't know, is a once-promising Michigan State quarterback whose life went into the drink with him one night when he mistook a boat ramp for the highway, and was pulled out of the icy water by a couple of pot-heads who happened to be nearby. The drunk co-ed who was sleeping it off in the backseat of his car didn't make it, washing ashore five days later. Ruddy took it on the chin, doing a prison term for murder even though he wasn't legally drunk. Now, after a further misunderstanding with the law landed him on probation, we find him dividing his time between such peaceful, fulfilling routines as bouncing at his sister's bar, repossessing cars for a lowlife named Milt, missing the voice in his head that claimed to be his fiancee Katie's dead father Alan, and... Well, I figured that last one might catch you. You really should catch up on your reading; that title again is Midnight Plan of the Repo Man. But trouble is never far from Ruddy McCann for very long. And when it comes, it comes in heaps. Two years after saving her from the men who murdered her father, Ruddy is worried about his relationship with Katie, who is talking about needing a break. He is worried about his best friend Jimmy, who is having an affair with a married woman; about a couple of crusty old barflies who have fallen prey to a scam; and about his new court-ordered psychiatrist, who actually cares whether he is taking his court-ordered medicine. And then a strange girl walks up to him and tells him he may not be responsible for the death of Lisa Marie Walker - an idea that somehow puts Ruddy on the trail of a serial killer. And then Milt suddenly dies, an apparent suicide - but something about it doesn't sit right. And then a banker, who Ruddy knows is the husband of Jimmy's girlfriend, hires Ruddy to do some of his dirty work - and it keeps getting dirtier. And then, and then, and then... once the pace gets rolling, these new problems swirl together into a Northern Lower Michigan winter storm of danger for Ruddy and everyone he holds dear. Oh yes, I forgot to mention - Alan comes back. And though Ruddy missed him while he was gone, he is more convinced than ever that Alan is really a figment of his imagination - though the disembodied ex-realtor would be hurt to hear that. The bickering, bantering chemistry of Alan and Ruddy is a lot like having "The Odd Couple" squeezed into one man's head, with Alan disapproving of Ruddy and Katie's romantic involvement, Ruddy's diet, Ruddy's household and personal hygiene, and Ruddy's damn-the-torpedoes, full-speed-ahead approach to dealing with people. Also back are Ruddy's lovable but malapropism-prone brother-in-law Kermit, who is now also his boss; ex-sheriff and all-around stand-up guy Barry Strickland, who is now his co-worker; Ruddy's lazy but lovable basset hound Jake; and the old familiar conks on the head, struggles for survival, gruesome surprises, sweeping crescendos of suspense and accelerandos of action, frequent touches of goofball humor and sweet romance, and the surprising patterns that fall out of Ruddy's distinctive way of juggling multiple complex problems. I already anticipate being a pest to local booksellers when the third book in this series approaches its release date. It hasn't been announced yet, but I'm sure it's going to happen, given the loose ends left dangling at the end of this most entertaining book. 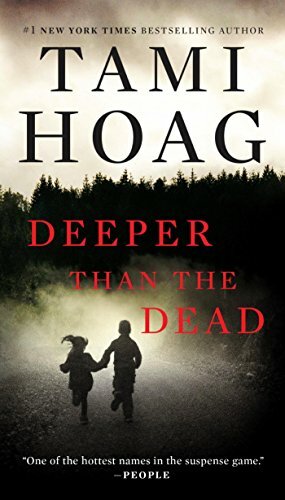 In this sequel to Deeper Than the Dead, newlyweds Vince Leone, a pioneering FBI profiler turned police consultant, and Anne Navarre, a fifth-grade teacher turned child psychologist and children's court-appointed advocate, get caught up in another gruesome murder mystery in the outwardly nice, town-gown community of Oak Knoll, Calif., circa 1985. The use of DNA evidence to solve crimes is only a gleam in sheriff's detective Tony Mendez's eye. The ability to search criminal justice computer databases is still years, and thousands of dollars worth of equipment, away. But before the case against the suspect in the town's previous serial killer case even goes to trial, the three protagonists and their fellow detectives find themselves again confronted with a vicious crime whose key witness is a psychologically damaged child. Four-year-old Haley was found strangled, but barely alive, next to her mother, a vivacious artist named Marissa. Or is it Melissa? Inquires into the victim's past keep turning up more questions. And, typically, the person who knows her best goes missing just when the need to know what she knows becomes crucial. Most perplexing of all, the artist's murder fits the profile of a crime of passion, but the arrival of mutilated body parts mailed to her patron suggests the work of a psychopath. Which is it? That question will decide whether Vince and Tony should be looking at the autistic savant who teaches math at the local college or one of the men in Marissa/Melissa's life who may have been a blackmail target. Meantime, while Anne tries to protect little Haley from further trauma until she remembers what happened to her mother, she becomes a target of not one, but two disturbed killers. For the most part, this is an absorbing, thought-provoking crime thriller, with a touch of nostalgia for an earlier era of crime detection, enhanced with well-realized characters and a keep-you-guessing mystery. For the most part. There was a point, unfortunately a very crucial point in the plot of the book, when I suddenly didn't buy the motivations of the characters in the scene. In the context of what had just happened in the very few preceding pages, I was thunderstruck by the preposterousness of the book's climax, in proportion with the high quality of everything up to that point. Try as I may, I still can't think of an explanation for a key decision Anne made in this scene that gels with what I know about her character, except perhaps that the author couldn't think of any other way to write her way out of the book. It isn't the solution to the mystery that threw me; I was totally on board with that - in fact, Hoag did a good job of foreshadowing it. It was more a matter of yelling at the heroine, "Don't go there! You're in danger!" when you know she isn't that dumb. 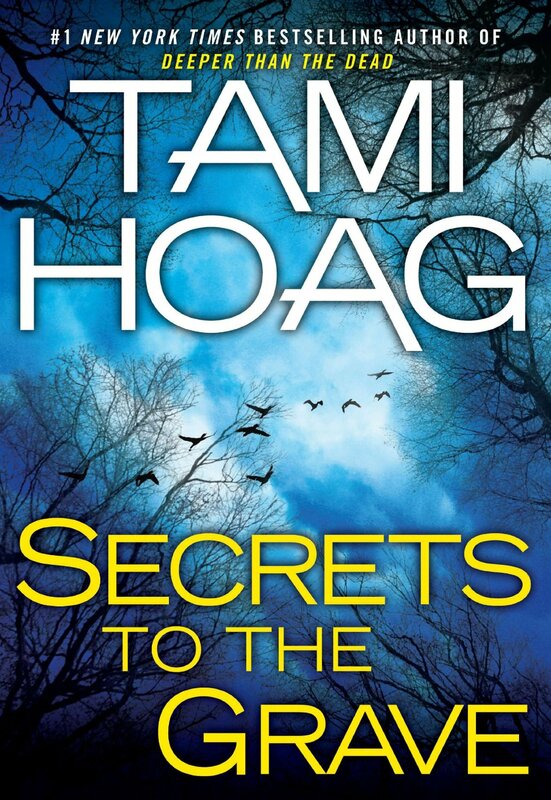 So, after reading two Tami Hoag thrillers, the score stands at 1 win, 1 loss. But since my judgment against this book is really based on one scene that ruined it for me, I'm open to giving the "Oak Knoll" trilogy a third try, if and when I see Down the Darkest Road for sale. This hymn was planned as a companion to an Advent midweek sermon series that a Lutheran pastor friend of mine was considering publishing as a pulpit resource for time-strapped preachers. 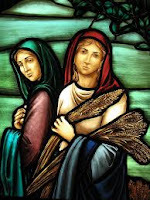 My preparation for writing it included reading all four of the pastor's sermons, which focus respectively on Ruth 1:20-21; Ruth 2:10; Ruth 3:13; and Ruth 4:17. As in my previous hymn for an Advent series, the intent here is for Stanza 1 to open the hymn and Stanza 6 to close it each week, and the appropriate stanza for each week to be inserted between them. The hymn-tune I have in mind is the early American tune FOUNDATION (Southern Harmony, New Haven, 1835), often paired with the hymn "How firm a foundation, you saints of the Lord." You are of our blood, and will surely redeem! With justice and love You unerringly deal. And stand undestroyed by the light of Your face? Surpasses all good that our works can achieve! Which also grants faith where Your promise is heard. And comfort eternal at last to reveal! Your servants a portion with them who now live! Redeem this dim hour by Your brightening day! Ellie, a high school junior in Rock River, Iowa, really cares about growing a giant pumpkin for the town's harvest fair. She calls it Max, and senses its moods, and eventually (with a bit of prodding from a cute classmate named Wes) even talks to it. She worries about bugs, hail damage, rot, and other natural hazards that can beset enormous vegetables. She worries, not without reason, about pumpkin burglars. She puts Max ahead of her homework, her social life, and even her relationship with her widower dad. All she wants, besides losing a few pounds of her own, is to see Max put on a lot of them and beat the reigning weigh-in contest champion, a slimy character named Cyril. Ellie is joined in her gourd-driven quest by a baseball crazy cousin named Richard, a hysterical dog named Spider, and her wise Nana, who knows a lot about working with the soil. But she has to be a fighter to raise a giant pumpkin, a quest that will push her emotional and physical limits. Win or lose, raising Max will lead Ellie to find healing, romance, and the respect of her community. This 1992 book was the first novel by the author of Rules of the Road and Hope Was Here. Having read these books, I sense a pattern in Bauer's work: a knack for discovering emotional truths in a story about a teenager with one all-absorbing, mature-for-her-years passion. Bauer's other titles since this book include Best Foot Forward, Thwonk, Sticks, Backwater, Stand Tall, Peeled, Close to Famous, Almost Home, Tell Me, and most recently, Soar. In a previous adventure, New York-born teen Jamie O'Neill and his mother moved to a small island off the coast of Northern Ireland - population: themselves - where the silent, one-armed boy and his funny, brainy friend Ramsay MacDonald made an amazing discovery. Using a family heirloom called the Salmon of Knowledge - really, an artifact of an ancient race not of Earth - they fell through a wormhole to the distant planet of Altair. There Jamie got back his arm (temporarily) and his voice (for good), helped save an alien civilization from an invading horde, and fell in love with a delicate yet tough beauty named Wishaway. Then he had to come home to save his mom, but thanks to a used-up battery, the Salmon wouldn't take him back to Altair. I don't usually give that much background before getting down to what a book is about, but in this case, the reminder is useful. Although I'd had this sequel in my collection since very soon after I read Jamie's first adventure, I let enough years pass before reading it that I had forgotten almost everything about it except the lingering impression of a superbly designed dust jacket. Someone who saw me reading it at a chorus rehearsal asked me to let him have the book after I was done with it, simply because he liked the cover art. That was ages ago. Without the first book to consult, I found my way back into the world of Jamie's adventures with no difficulty. This book filled in all the gaps in my memory, just when they needed to be filled, without any awkward sense of time being wasted on a review of things past (like, say, in the first paragraph of this review). That's a tough balance to hit. Another thing this book brought back to me was the enjoyment of crisp dialogue between interesting characters. The dialogue carries the reader over the threshold of willingly suspending disbelief while two-thirds of a rock band, fresh back from a miserable showing at a Belfast-Has-Talent audition, recover their spirits by replenishing the Salmon's power supply. They only black out half of Ulster in the process. Then Ramsay, his much older half-brother Brian, Jamie, and Jamie's mother Anna take a quick peek at Altair, just for fun. The fun turns into trouble when Brian and Anna are captured by the Witch Queen of Alkhava, while Ramsay and Jamie end up facing her brother, the bitter and scarred Lord Protector Ksar, in a battle against their friends. Jamie finds out Wishaway waited exactly a year for him to return, and only a few days have passed since she accepted the marriage proposal of young Prince Lorca of the Oralands. As if to sharpen his heartache, they return to her city after Ksar escapes, only to receive an ultimatum from Alkhava, demanding the Salmon in exchange for Brian and Anna. The Witch Queen wants to lead her people to Earth, to escape the increasingly hostile climate of their dying planet. Ksar just wants to avenge his personal injuries on Jamie and Ramsay, who bested him a year ago. With Wishaway's people refusing to help, Jamie accepts an offer of help from Lorca's royal grandfather - who, however, has his own designs on the Salmon, and is willing to murder Jamie to get it. Before this becomes an issue, however, the friends must face their enemy at the gates of the Witch Queen's capital city. Their survival, not to mention the fate of worlds, soon depends on a small group fighting for survival in a harsh wilderness, with enemies at their heels and weird, alien mysteries ahead. Romantic tension, betrayal, deadly battle, and a wild ride in a machine not built for human passengers fill the climactic pages of this book. And though its conclusion is very satisfying, it does leave certain questions wide open for another sequel. This is the second book of the Lighthouse trilogy, between The Lighthouse Land and The Lighthouse Keepers. Adrian McKinty is a native of Northern Ireland who lived several years in the U.S., and currently resides in Australia. Most of his fiction comprises crime novels for adults, and is often based on his native country's period known as the Troubles. Their titles include Dead I Well May Be, Police at the Station And They Don't Look Friendly, and Orange Rhymes With Everything. A while ago, I bought a trade-paperback copy of a funny, romantic mystery-thriller called The Midnight Plan of the Repo Man off a Walmart magazine rack. Every so often, I've gone back to Walmart looking for its sequel, Repo Madness. I just liked the first book that much. Late last week, while I was doing that very search, I spotted this book by the same author, and decided to give it a shot. And now, several wads of Kleenex later, I can definitely say the experiment was worthwhile. 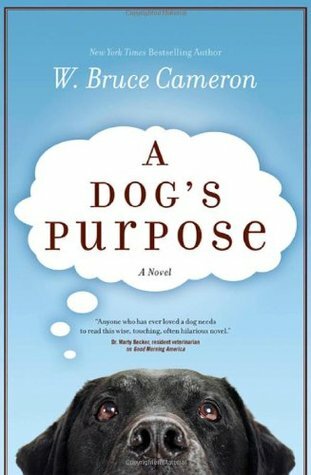 A Dog's Purpose is a heart-warming, tear-jerking story told from the first-person perspective of a dog - perhaps better described as a series of dogs, but basically the same doggy consciousness. With each rebirth, he (or, in one lifetime, she) remembers his or her past-life experiences, but wants to end the cycle of reincarnation by trying to discover its purpose as a dog, and accomplishing it. It hangs onto lessons learned in previous lives, helping it home in on achieving its purpose - which has something to do with finding and saving people, something to do with having the intelligence and fearlessness to explore its world, and a whole lot to do with loving, and being loved by, one special boy named Ethan. I'm done summarizing the story now, for two reasons. First, I've already gotten myself choked up. I'm an emotional mess. Forget about it. The second reason is, if you knew any more, I would have to kill you to prevent the spoilers from spreading any further. And, as you already know, I'm too verklempt to make the effort. It's a lovely book, full of laugh-aloud humor and sob-aloud sorrow, heart-warming affection, and just a little of the mystery-thriller action I was angling for when I trawled the Walmart magazine aisle. I loved the characters, including the humans, dogs, cats, a donkey, and more. I cheered for the hero dog's quest to escape the wheel of doggy karma. And I realized that, in spite of their limitations, a dog's point of view really can be the focus of an excellent story. Soon (like, January 2017) to be a film starring Dennis Quaid, this book has a sequel, A Dog's Journey, and two spin-off novels designed for younger readers, Ellie's Story and Bailey's Story. Ellie and Bailey, by the way, are the names of two of the hero dog's avatars in the original novel. 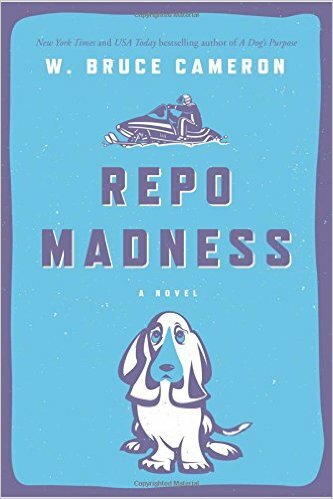 Most of Cameron's other novels also seem to involve dogs, including the "Repo Man" series, whose main character's best friend is a bassett hound. Cameron is also the author of several non-fiction humor books, including 8 Rules for Dating My Teenage Daughter. Anne Navarre is a fifth-grade teacher in Oak Knoll, California, who once aspired to be a child psychologist, until her mother died and she had to move home to take care of her cold, selfish father. Vince Leone is an FBI profiler on medical leave due to having a bullet in his head, who has come to town with half a mind to recruit an ambitious young sheriff's detective named Tony Mendez as his replacement. Between them and a few other deputies, they have to stop a serial killer who has killed at least three women, and who has already abducted his fourth victim. This creep becomes known as the See No Evil killer, because he superglues his victims' eyes and lips shut before torturing and strangling them. Four of Anne's students found the body of Victim No. 3, gruesomely left half-buried in a wooded park. While she tries to help them deal with this disturbing discovery, they show varying types and degrees of psychological damage from the experience. Meantime, Vince's profile seems to fit the fathers of at least three of the kids - a charming dentist who has to put up with a controlling, histrionic wife; a handsome lawyer who cheats on his wife; and an abusive, woman-hating deputy whose career is all "by the book, no mercy." Worse, all three men have ties with the local women's organization, whose staff and clients seem to be the killer's prey of choice. While the investigation is sidetracked by a trail of evidence leading to a second and unrelated killer, sending shudders through a pleasant town that only a week ago had never known a murder before, the cycle of tragedy goes into overdrive. At the center of the whirlwind are four deeply scarred children, three families being torn apart by the strain of the investigation, two lonely hearts swiftly drawn together by a May-September romance, and at least one child who is fated to learn that his (or her) idolized father is a murdering psychopath. As time runs out for the missing fourth victim, as pressure builds on both the cops and the creeps, as pits of personal and professional ruin yawn before the innocent and guilty alike, it becomes inevitable that more blood will be shed before the bad guy is caught - if, indeed, he can be stopped at all. This is a superbly crafted mystery-thriller by the experienced author of many novels of crime and romance, including the Quaid Horses and Doucet trilogies, the Rainbow Chasers quartet, the two-book Deer Lake, Elena Estes, and Broussard & Fourcade series, and the six or seven Kovac/Liska novels, besides nine or ten stand-alone titles such as McKnight in Shining Armor and Kill the Messenger. This book, the first installment in the Oak Knoll trilogy, is a strong introduction to a group of vividly realized characters, a believably complex community in which danger simmers under a charming and safe-seeming surface, and an intriguing look back at the state of crime detection in 1985, when police had to get by without computer databases and DNA analysis. It's a detailed and compelling glimpse of police procedure in an era when fingerprints had to be compared by the human eye, when "cellular telephones" were such rare, clunky luxury items that detectives could reasonably ask why a suspect would need one, and when people frequently dropped pop-culture references about Miami Vice and Magnum, P.I..
Ah, those were the days! Instead of CSI gizmos, cops confronted by a serial killer had to rely on criminal profiling, which itself was brand-new and imperfectly trusted. But at the heart of this mystery is a young teacher's love for her kids, even for one who is horribly, irreparably damaged. She only hopes it may not be too late to help the other three. But her danger and their danger become intertwined in ways that flood the reader's inner world with sympathy, then anxiety, then downright dread. The story winds up to a terrific climax, fueled by flawless theatrics and darn-near flawless writing. My hopes are high for the sequels, Secrets to the Grave and Down the Darkest Road. After losing her husband and her teaching job in quick succession, recent widow Bella packs up her 5-year-old son Max and what belongings will fit into her small car and hits the road, hoping to make it from the New York City suburbs to her mother-in-law's cold, unfriendly home in Ohio with only one night camping out along the way. But somewhere in western New York state, a storm blows up, and a mysterious billboard advertising a non-existent campground leads them astray. But it is finally an encounter with a very pregnant cat that leads them to the odd little village of Lily Dale, birthplace of the Spiritualist movement and home to many psychics and mediums to this day. An attempt to return the queen kitty to her owner leads, somehow, to Bella being hired as a temporary manager for a guesthouse just as the town's busy season of psychic readings picks up. She doesn't believe in all the mystical stuff that brings everyone else to town. She just wants to move on, both in her grieving process and in her search for a new home, as soon as her car gets out of the repair shop. But during a weekend of spooky manifestations and all-too-real human threats, Bella finds herself at the center of a web of mystery. 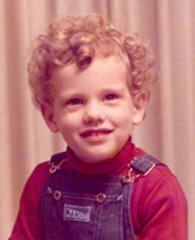 If the eyewitness testimony of a rambunctious little boy and the clairvoyant dream of an eccentric neighbor count for anything, they add up to the possibility the owner of the cat and the guesthouse was murdered - possibly by the same person who has been sneaking around the guesthouse and attacking solitary guests. Before Bella can decide whether to accept Lily Dale's offer of a home and perhaps a little romance, she must learn to trust the eccentric people around her. But to do that, she may have to solve a mystery that puts her and everyone she loves in danger. This is a fast-reading, emotionally involving piece of entertainment by a seasoned author whose sentences, only once in a while, go clunk. Parts of it were touching enough to make me feel misty-eyed with sympathy, for example, when she praises little Max's courage when, loaded into the car and about to leave behind the only home he has ever known, his small voice says "Yes" to his mother's "Are you ready to go?" The mystery has its thrills and its red herrings, and in spite of one character's complaint there are no straight, available men in town, Lily Dale presents Bella with an overabundance of romantic choices - no doubt, to be explored in more detail in subsequent books. This is the first of (so far) two books in the "Lily Dale Mystery" series, not to be confused with the four-book "Lily Dale" series, featuring a character mentioned but not seen in this book. The sequel is titled Something Buried, Something Blue. Sometimes writing as Wendy Markham or Wendy Morgan, Wendy Corsi Staub is also the author of the Campus Life 101, Live to Tell, Nightwatcher, and Murphy's Landing series, plus numerous other novels, mostly of the paranormal thriller and crime thriller types; some books for younger readers, such as Henry Hopkins and the Horrible Halloween Happening; and several mysteries co-authored with former New York City mayor Edward I. Koch. Within the past few weeks, I've gone to see two movies in theaters. On Thursday night, Nov. 15, I caught a sneak preview of the new movie from the Harry Potter universe, Fantastic Beasts and Where to Find Them. Written directly for the screen by J.K. Rowling herself, it exults in the ability to get its whole story out on screen, without having to cut all the connective bits that made an original novel make sense. 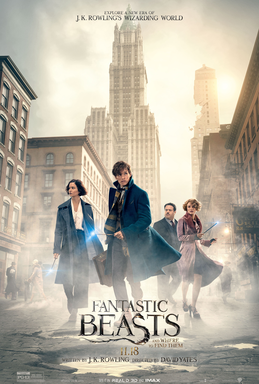 The critics have already done a great job of pointing out how the film welcomes viewers in with a Pokemon Go!-esque "find the fantastic beasts" storyline, while slowly warming up to a much darker and more dramatic tale about a repressed magic gone septic and how that fits into a dark wizard's agenda. My only two complaints about the movie were that said dark wizard's final remark is so cryptic (What was that about dying a little?) and that it wasted some attractive characters, such as the newspaper editor (played by Jon Voight) and his younger son (Ronan Raftery), who after a certain point just stand there and visibly react to what's going on in front of them. There must be some important reason for including these characters in the movie; perhaps it will become clear in a sequel, of which (I hear) there will be four. 1. Newt Scamander (recent Oscar-winner Eddie Redmayne) performs a mating dance to coax an erumpent (don't ask) into his suitcase, which is much bigger on the inside than it looks on the outside. Combined with the subsequent madcap chase across part of New York's Central Park, this is comedic genius with a bite of the bizarre. It's also deftly choreographed, exciting, and suspenseful. 2. Ordered to their deaths, Newt and American witch Tina Goldstein (Katherine Waterston, Sam's daughter) fight their way out of an execution chamber where victims are apparently supposed to be lowered, via levitating chair, into a pool of some kind of annihilating liquid. Sorry, I haven't read the screenplay, so I don't know how to describe this. It's just an incredibly creepy scene. 3. Samantha Morton, playing an anti-magic fanatic, checks out a street urchin for signs of the witch's mark, then pronounces him OK. Her menacing sweetness channeled Louise Fletcher as Nurse Ratched in One Flew Over the Cuckoo's Nest. I meant to see this on my recent interstate vacation as well, but my plans changed on short notice (again, don't ask). Just saw it tonight. Bawled through a good deal of it. Saw an impressive amount of none-too-subtle Christian symbolism woven into its imagery. Appreciated that it was a powerful war movie about a pacifist who stuck to his convictions in the face of tremendous adversity - ultimately earning the first Congressional Medal of Honor ever awarded to a conscientious objector. It's sickeningly violent but also a moving testimony to the power of conviction and the importance of the freedom to live by it. 1. Army medic Desmond Doss (played by sometime Spiderman Andrew Garfield, almost the lone American in a mostly Australian cast) sits all alone in carnage-strewn battlefield, after trying but failing to save a buddy's life. In a rare moment of doubt, he desperately asks God, "What do you want from me?" Long pregnant pause. Then a man's voice comes to him out of the falling night: "Medic!" 2. In the opening moments of the movie, a drunk Hugo Weaving (as Doss' father), visiting his World War I buddies' graves to share a drop of whiskey with them, loses control and smashes the bottle against one of the gravestones. Blood drips on the stone. As he wraps up his cut hand, he dryly says, "Well, that's all I have for you today." It's hard not to love practically every scene Weaving is in. While I'm at it, I might as well also mention one in which his character bursts into tears at the dinner table after telling off the first of his two sons who has decided to enlist in World War II. It's not every actor who can turn an abusive drunk into a sympathetic character. 3. The scene in which Doss finally, against his convictions, touches a gun - only to use the rifle as part of an improvised litter to drag a wounded sergeant (Vince Vaughn) to safety. 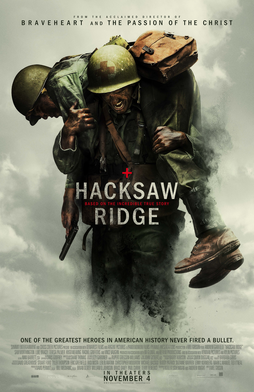 Vaughn's moment of disbelief was matched only by mine, since my research prior to viewing the film told me that, in reality, Doss used the stock of a rifle to bandage his own badly broken arm after being hit by multiple rounds of enemy fire, before dragging himself to safety. And this, in turn, was after he was hit, and while being stretchered out of the combat area, made the stretcher bearers leave him and take a more seriously injured man instead. What I'm saying is, although many people may have a hard time believing Doss' heroism as depicted in this film, it actually undersells it - big-time. I'm not a Seventh Day Adventist, as Doss was. Nor is Mel Gibson, who directed this movie. I don't hold Doss' conviction about touching deadly weapons - a conviction that, according to the movie, turns out to be based more on incidents in Doss' boyhood than on the letter of SDA doctrine. But I am pretty impressed to see a movie mounted on this scale, depicting a Christian man who never compromises the tenets of his faith in spite of every shade of opposition ranging from reason to an imminent threat of prison, and depicting him as a hero who brings hope, courage, humility, and awe to the men around him. Sam Worthington asking Andrew Garfield for forgiveness may strike some as a bit too strong. But there is something admirable even about men who have the bigness to repent when they are proven wrong. And there is something utterly, movingly satisfying about this movie, all the way to the pre-credits footage depicting the aftermath of the dramatized events.